Rectify (#2) obviously can win this race at a short price, but he’s the kind of horse whom you really wanted to have last time, when he went off at 7-2 and trounced a softer field than the one he meets today. That said, he did run especially fast in doing so, earning a 123 TimeformUS Speed Figure. The Pace Projector is predicting that he will be clearly in front early in a situation favoring the leader, so he’s got plenty of angles working for him. However, he does face some serious foes here. There are a slew of runners coming out of last month’s Hollie Hughes Stakes. That race featured a fast pace that collapsed late, so I don’t really want the closers exiting the race. Loki’s Vengeance (#5) ran better than his fifth-place finish suggests, but I’m still not entirely convinced he’s sitting on his best effort. Therefore, I’m landing on OSTROLENKA (#6). This is an interesting claim by David Jacobson, who runs him in a protected spot in his first start for the barn. Ostrolenka has simply been facing tougher fields lately. He was compromised at the start last time when beaten by impressive next-out winners Spartiatis and Still Krz – both of whom improved their speed figures – in an effort that is better than it appears. 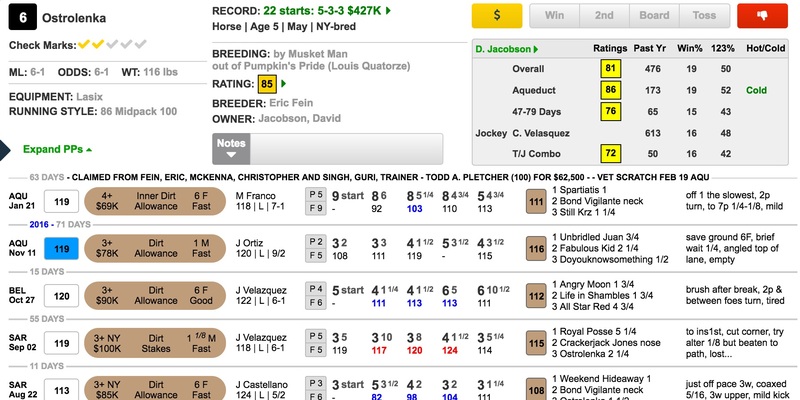 I’m hoping that Cornelio Velasquez can keep him closer to the pace this time since he typically runs his best races when he isn’t left with so much ground to make up late.